Great wine. Shopping in downtown Roswell. Perfect Spring weather. What more could you ask for? That’s what you’ll get & more, at Star 94.1’s Shopping Under The Influence on April 13th! 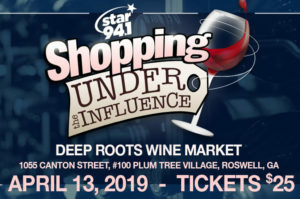 You will get samples of wine from Deep Roots Wine Market, discounts at some of the best stores in downtown Roswell and commemorative stemless wine glass! Plus live music from Brian Wiltsey and food by Gracious Plenty Bakery & Breakfast! There’s a very limited number of tickets, so get yours now! Here are the participating shops where you will receive special discounts and offers while sipping wine in each shop!